Der Artikel Palwasha Bazger Salam: The Wisdom of Ahmad Shah: An Afghan Legend: English-Dari Edition wurde in den Warenkorb gelegt. Ihr Warenkorb enthält nun 1 Artikel im Wert von EUR 10,11. Two hundred and fifty years ago, the Great King Ahmad Shah Durrani ruled Afghanistan, and from there, a magnificent empire extending from eastern Iran to northern India, and from the Amu Darya to the Indian Ocean. Known to his people as Ahmad Shah Baba (Ahmad Shah, our father), the king was loved by his people as an outstanding general and a just and wise ruler. But the King was troubled - all kinds of troubles threatened his kingdom. He needed to find someone with the right qualities to help him - but how does one find such a person? Among other things, this story provides a framework through which young readers can consider and discuss the qualities one needs to live a useful and happy life. 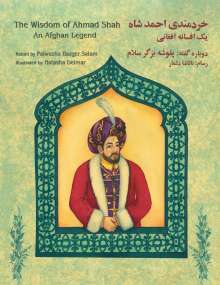 Additional pages include a biography of Ahmad Shah, a map of the Durrani Empire, and suggested discussion points.